Haptic Author was a research project dealing with the writing and modifying of multi-dimensional English sentences and sentence fragments purely through touch. The goal was to discover new ways of presenting and accessing electronic information other than “link clicking” through static content. Often times these experiments blurred the line between subject and object and could shift the narrative voice depending on the user’s input. The project consisted of dynamic sentences with four or more potential versions “hidden” behind each other that could be accessed via custom software designed for a Panasonic touch screen. For this version only binary changes were made at the word level, though multiple changes could be possible. 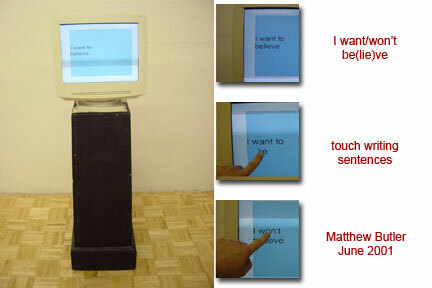 Shown here is the ‘I want/won’t (to) be(lie)ve’ sentence as part of an installation at the Parquet Gallery in Iowa City. This entry was posted on Monday, June 11th, 2001 at 3:37 pm	and is filed under digital, language, projects. You can follow any responses to this entry through the RSS 2.0 feed. You can leave a response, or trackback from your own site.